So many of my (so very few) readers know that I regular work with social media in my various capacities as instructional designer and instructor. I have also been a social media strategist for NERCOMP and NEPCA over the years and provided consultations on social media for different individuals and organizations. Social media is something I think, read, discuss, and use a lot. So when I recently learned that a Jeanine O'Neil was contemplating giving up her courses on social media at North Shore Community College's Community Education (their noncredit courses), I talked with her and them noncredit program to find out about trying to fill the gap. This first course will run from February 24-March 10 on Tuesday evenings from 6pm-9pm at the Cummings Center in Beverly. 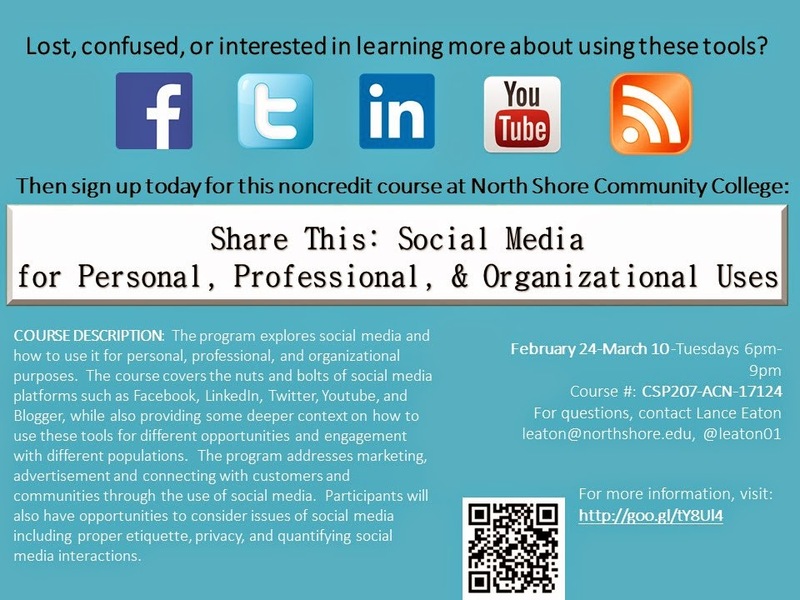 I hope that this course will provide individuals with a strong understanding of social media that goes beyond just how to use it or why to use it, but a solid grounding in the benefits of using it for self or organizational promotion as well as developing an extensive social network of people to provide new opportunities and connections. The course description is as follows: "The program explores social media and how to use it for personal, professional, and organizational purposes. The course covers the nuts and bolts of social media platforms such as Facebook, LinkedIn, Twitter, Youtube, and Blogger, while also providing some deeper context on how to use these tools for different opportunities and engagement with different populations. The program addresses marketing, advertisement and connecting with customers and communities through the use of social media. Participants will also have opportunities to consider issues of social media including proper etiquette, privacy, and quantifying social media interactions."